President Lyndon Johnson’s first state dinner took place in December 1963. It was a BBQ for West German Chancellor Ludwig Erhard and was held on his ranch in Stonewall. This weekend, The National Park Service and Friends of LBJ National Historical Park invite you to join them in the re-creation of a historic barbecue hosted by President and Mrs. Johnson, Saturday, October 23rd, from 4 – 9 pm. The live oak shaded air will fill with the sounds of Asleep at the Wheel as you enjoy the aroma of Texas barbeque drifting through the crowd. LBJ Library Director Mark Updegrove will take a humorous look at the Rancher-President who loved nothing better than welcoming guests from around the world to their beloved LBJ Ranch. The event begins at 4:00 PM and continues into the evening. The BBQ dinner will be prepared on-site by The Salt Lick. The Barbecue is sold out, but you can put your name on the wait list. You may register online by clicking: Register Online. 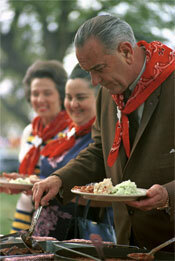 The Huffington Post has an article about President Johnson’s legendary barbecues.